The Tambopata Candamo National Reserve is one of the few territories of the Amazon that is still preserved, to a large extent, in its original state. However, its original state is being affected, turning this natural reserve into a situation of worrisome vulnerability. Various negative actions endanger the reserve: agriculture and land invasion, gold mining, illegal extraction of wood, excessive extraction of natural resources (meat of wild animals, fish, fruits and palm leaves, among others) , the asphalting of the south interoceanic highway, the increase of the migratory processes, etc. etc. It houses 3 different ecosystems: the eastern slope of the Andes, the Amazonian plain and the savannas ecosystem. The Tambopata Candamo National Reserve and the Bahuaja Sonene National Park were created from the same protected area, they are contiguous protected areas that form a unit. It harbors a large part of the Peruvian biodiversity, considered one of the ecosystems with the greatest biodiversity in the world. It presents great diversity of habitat and abundance of species. The flora is composed of more than 1 thousand 400 species. The Heath River and its pampas are a unique ecosystem, with periodically flooded pastures, renewed through occasional fires in the dry season avoiding the advance of the invasive vegetation of the jungle. Small forests or groups of trees grow like islands in the pampas. The flat areas are dominated by grasses, reeds, other grasses and shrubs. The access roads are; Airway from Lima, Arequipa or Juliaca – Cusco to Puerto Maldonado. By highway; from the city of Cusco-pto. Maldonado. Puno – Juliaca – Sandia – Putina Puncco towards the southern area of the protected area. From the city of Puno – Juliaca – Macusani – SanGabán to the Inambari river. Access by river through the Madre de Dios and Tambopata rivers by boat, by motor canoe along the Tambopata, Malinowski, La Torre, Tavara and Candamo rivers. 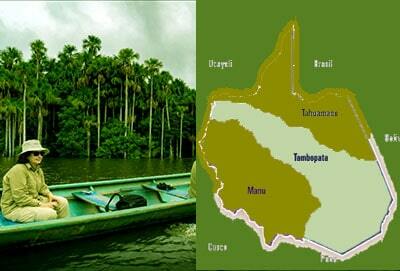 The Tambopata river basin presents one of the highest indices of biological diversity in the world. Among its most common ecosystems are palms, marshes, bamboo and riparian forests, whose physical characteristics allow local people to take advantage of natural resources.